November 22, 2018 – The Real Casa de la Moneda (Royal Mint of Spain) has issued four gold coins commemorating the introduction of the peseta and the consequent disappearance of the escudo. Each one is a reproduction of a coin of a certain time period. 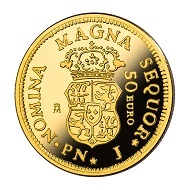 Spain / 50 euros / gold .999 / 3.375 g / 19 mm / Mintage: 2,500. A reproduction of 1 escudo coin struck under Fernando VI in 1759 at the Casa de la Moneda de Popayán, Colombia. The obverse of this coin shows the wigged bust of Fernando VI, surrounded by the legend FERDND.VI.D.G.HISPAN.ET.IND.REX. and 2018 as the mint year. On the reverse, the Lesser Royal Coat of Arms of the monarch, castle and lion quarters, with the Bourbon escutcheon in the centre, surrounded by the legends: NOMINA.MAGNA.SEQUOR.J. the mark of Real Casa de la Moneda, along with the face value, 50 EURO. 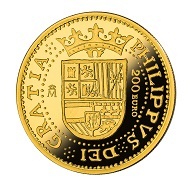 Spain / 100 euros / gold .999 / 6.75 g / 23 mm / Mintage: 2,000. A reproduction of a 2 escudo coin struck under Felipe III in 1607 at the Segovia Mint, Real Ingenio de la Moneda de Segovia. The obverse of the original coin shows the Royal Coat of Arms of Felipe III with the quarters of Castile and León, Aragon and Sicily, Granada, Austria, Burgundy (old and new), Brabant, Flanders and Tyrol, with the blazon of Portugal in the centre of the upper half. To the left of the coat of arms, the mint mark, the Segovia aqueduct, and C, the assayer’s initial. To the right, the face value, 100€. The devices are surrounded by the legend: PHILIPPUS.III.D.G.(DeiGratia). 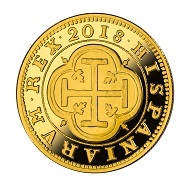 On the reverse, the Jerusalem Cross inside four semicircles joined by ivy leaves, surrounded by the legend HISPANIARUM.REX. 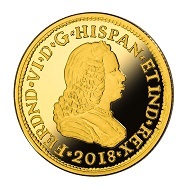 The mint year, 1607, is replaced by the current one, 2018. Spain / 200 euros / gold .999 / 13.5 g / 30 mm / Mintage: 1,500. 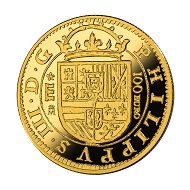 A reproduction of the Castilian gold 4 escudo coin, struck at the Seville Mint during the reign of Felipe II. The actual mint year is unknown as coins did not carry the number of the year systematically until 1588. The obverse of the original piece bears the monarch’s Royal Coat of Arms with the quarters of Castile and León, Granada, Aragon, Sicily, Austria, Burgundy (old and new), Brabant, Flanders and Tyrol. To the right of the coat of arms the face value, 200 €, and in the left reproduction of the mint mark. The whole is surrounded by the legend PHILIPPUS DEI GRATIA. On the reverse, the Jerusalem cross-cantonée, four leaves, set within an orle of four semicircles and surrounded by the legend HISPANIARUM.REX. and 2018 as the mint year. 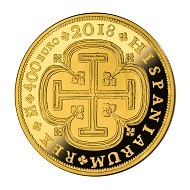 Spain / 400 euros / gold .999 / 27 g / 38 mm / Mintage: 1,000. 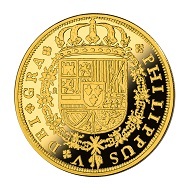 A reproduction of a gold 8 escudo coin, struck at the Madrid Mint in 1719, during the reign of Felipe V. The obverse of the original coin shows us the Royal Coat of Arms of Felipe V, with the quarters of Castile, León, Granada, Aragon, Sicily, Austria, Burgundy (old and new), Brabant, Flanders and Tyrol, with the escutcheon of the House of Bourbon in the centre. The coat of arms is surrounded by the Golden Fleece, with the Cross of the Order of the Holy Spirit on its chain. In a circular direction, the legend PHILIPPUS.V.DEI.GRA(Gratia). On the reverse, the Jerusalem cross-cantonée, four leaves, set within an orle of flowery semi circles, surrounded by the legend HISPANIARUMN.REX. 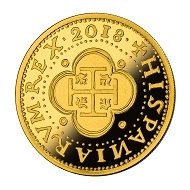 mark of the mint, face value 400 € and the mint year 2018. More information is available on the Real Casa de la Moneda website.